Summer will be over soon and before we know it, colder weather will be setting in. This is a time to be thinking about teaching your young driver how to drive in winter weather conditions. This is a good time to get your youth enrolled in driver school. When you add big trucks into the mix of cold weather driving, the odds are that we will begin seeing an increase in collisions occurring as well. Even with the best CDL training, a truck driver still relies on the drivers around them to be aware of them. So for new and younger drivers, or anyone who may need a quick refresher, below are the 4 B’s that all drivers should remember when sharing the road with big trucks. It is an absolute must to be alert when you are behind the wheel. Frequent inattentive drivers contribute to many fatal accidents that claim innumerable lives each year. When you allow yourself to be distracted, you are contributing to the problem. Remember to put the phone down and don’t worry about the radio. Focus on what’s happening directly in front and around you. This can save lives, including your own. • Do not text and drive. In fact, avoid using your phone altogether. The National Highway Traffic Safety Administration has stated that over 20% of fatal car collisions involving young drivers from 15 to19 years old, were because of mobile phone distractions. • Do not be a Rubbernecker! This happens when you turn your head quickly as something catches your eye and you try to see what it is. What occurs is a sudden loss of focus on the road. Not only that, but as you turn your head, invariably your hands turn that direction as well which may allow you to slide outside your lane and into another or oncoming traffic. • Remember that distraction comes in many ways and through different influences inside and outside of your vehicle. Think about this is you have to arise early to drive to class. Most teenage drivers know about blind spots that cars have. However, for large trucks, particularly ones that are pulling trailers, the blinds spots are magnificently bigger. This blind area is referred to as the No-Zone. The most important thing to keep in mind about bind spots is this: If you cannot see the truck driver, then he cannot see you! 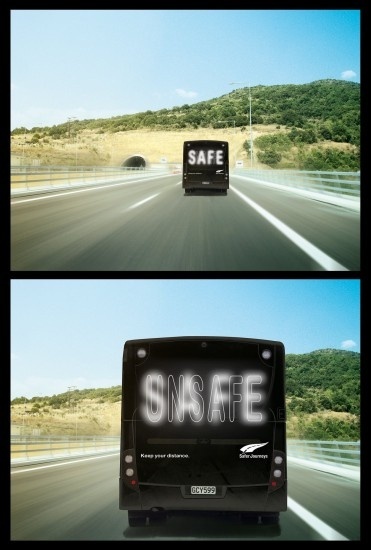 • Do not drive in a trucks blind spot. It is dangerous. Their blind spots are on the right and left side of the cab. When you cannot see the driver of the truck in the side mirror, you are in his blind spot and must get out. • Directly behind a large truck is the biggest No-Zone. The truck driver can’t see you and you un turn can’t see what vehicles might be in front of the truck. This can greatly reduce the time you have to react. 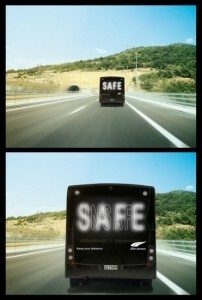 • Right in front of a big truck is unsafe as well. Trucks need a lot more time to and space to make a full stop, unlike smaller vehicles that can usually stop and maneuver much quicker. It may seem obvious, yet when you’re impatient and upset it’s easy to forget to be considerate. Keep in mind that everyone on the road needs to get to a destination. Large trucks aren’t just there to annoy you. Driving on our roads necessitates a great deal of trust, and being respectful of each other’s boundaries helps establish that trust. Just reading this post shows that you have taken a great first step to ensuring your safety and the safety of others. Remember: Your mind in the car and eyes on the road. Drivers of huge trucks need quite a bit of time and space to react to things that happen on the road. Other drivers can help make the road safer by keeping their driving predictable and steady, especially when driving through another car’s blind spot. • Always keep a constant level of speed when driving around big trucks. When entering their blind spot, maintain your speed and be predictable and visible. • Change directions cautiously and slowly. Avoid weaving in and out of lanes. Driving a large truck requires more focus without having to worry about erratic drivers. • Signal in plenty of time prior to making moves in traffic. This will allow other drivers enough time to adjust and react to your lane or direction change. Review with your young driver these 4 B’s of driving with larger trucks. Knowing these things and practicing them can help your teen be a safer driver and avoid collisions. This entry was posted in Top Driver Blog and tagged Big Trucks, Driver School, Teen Driver, Teenage Drivers.